At 5:30pm as I was sitting on my couch, I received text from Chase Bank: A $255.00 debit card transaction to NEW YORK ROAD RUNNER on 05/29/2013 5:32:22 PM EDT exceeded your $125.00 set Alert limit. (I get alerts on anything over $125 to make me feel guilty about spending money). I screamed, I jumped, I scared the crap out of my cat, who is still hiding in my closet. 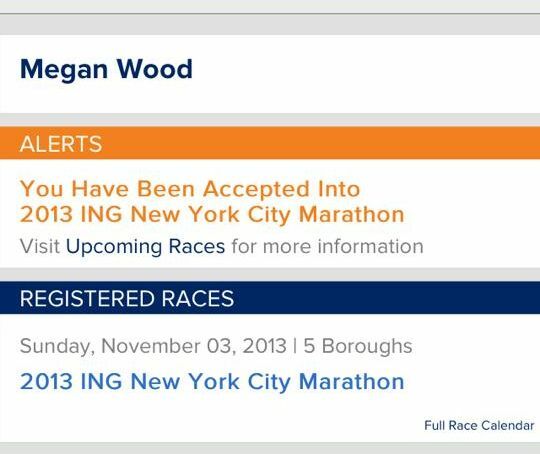 I, Megan Michelle Wood, am running the 2013 ING New York City Marathon!!!!!!!!!!!!!! Holy Crow......Here's the fun part - this prestigious event will be my first full marathon. I am a girl that dreams big - what can I say. My training for the Dopey Challenge was to kick off in July but I am going to start this weekend. This will put me perfectly on track to run the full marathon on November 3rd. Check out the ING New York City Marathon Course below - I see many visits to my hometown of Daytona Beach to do bridge runs over the next few months. 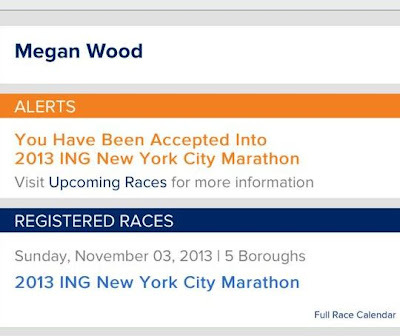 I'M RUNNING THE NEW YORK CITY MARATHON!! EEEEEEEEEEEEEEE!!!!! So ridiculously proud of you! Whohoo!! Way to go! Excited for you.